cost only $20-$25 per month for one coupon! Click here to learn more about Local First Vermont. Do I have to join VBSR to be included in the book and app? No. However, VBSR members get a discount when they put a coupon in the book/app, and they receive a free VBSR/Local First Vermont banner and window decal. Do all local businesses qualify to participate in the book and app? The business is privately held, not publicly traded. More than 50% of the business ownership (i.e., the business owners), must live in Vermont. The business is based in Vermont* and has no corporate or national headquarters outside the state. The business can make independent decisions regarding the name and look of the business, as well as all business purchasing practices and distribution. What’s the deadline for being in the book and app? Your coupon info form needs to be submitted by May 15th. If you sign up today, we may be able to include you in the app for additional months – for free. How much does it cost to be in the book and app? The fees below are the total price to be in both the book and the app (one price includes you in both). 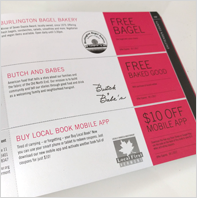 **Businesses who purchase at least one coupon in the Buy Local Book are invited to join VBSR at a $75 discount (with the exception of the start-up rate). Sponsors are VBSR member businesses and organizations that commit to purchasing at least $2,000 worth of Buy Local Book ads, books or apps. Sponsors receive year-round recognition as a Local First Vermont sponsor, including their logo on the inside front cover of the Buy Local book.